Buffalo Niagara is the largest economy in New York State outside of the New York City metropolitan area, with over 672,000 jobs, nearly 38,000 firms, and a labor force of nearly 735,000. Our economy generates $54.9 billion in gross metropolitan product. Exports account for nearly a fifth of production and totaled $9.3 billion in 2014. 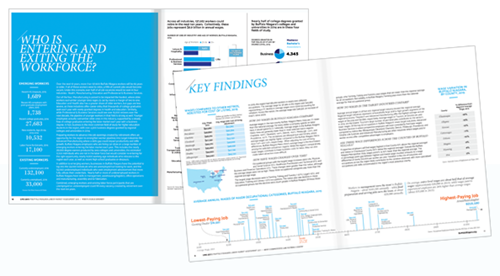 To learn more about Buffalo Niagara’s labor market, download findings from our 2017 Labor Market Assessment. Who’s Our Economy? – offers an overview of the regional economy, labor force, and target industries. How Competitive Are Payroll Costs? – examines regional wages, salary trends and employee benefits.